People always want to learn something new about foreign countries. And what is the better way to get some new information than by traveling around the world. Sooner or later, but you can’t escape getting to one of the biggest counties of the world - Russia. Mostly it is covered with coniferous forests. 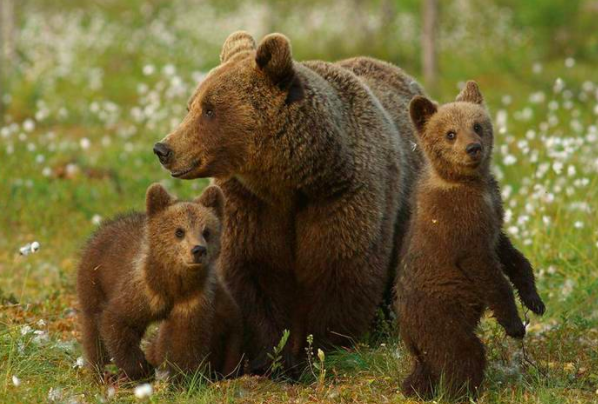 The brown bears live in forests. Thе bears are very strong and dangerous animals. They rarely attack humans, because they live deeply in the forest. But when you look at this big, heavy and powerful predator, you just can’t feel safely. Who can better tell you about it, than a man that lives there? So all that stories about bears are not just rumors. They are actually very and very truthful. Bears always were cultivated by Russians, especially in ancient times. In that times people respected bears. Lots of rock paintings were found in caves. Those animals always were cultivated in myths. People praised strength and agility of bears. Also, bears often take part in Russian fairy tales. There were lots of situations, when bears, because of starvation came into villages and attacked humans. The first mention of that kind of situation is dated in 1526. Baron Sigismund von Herberstein wrote about it in his “Notes on Muscovite Affairs”. After him, many historians wrote very familiars topics about Russia and bears. So, complication of Russian traditions and historical facts made everyone think about bear as a symbol of Russia.